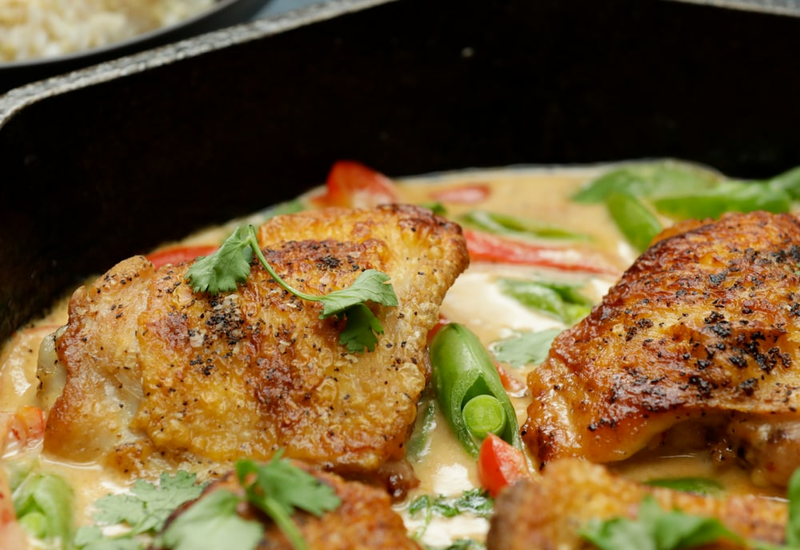 Here I’ve borrowed the traditional technique and flavors of a Thai chicken curry, but I use bone-in, skin-on chicken thighs for a juicier meat and a more stunning presentation. Swap in your favorite veggies, or whatever you have on hand. Cubed sweet potatoes with kale stirred in at the end in place of snap peas would be a perfect substitution. Swap in bone-in, skin-on chicken breasts if you prefer white meat to dark. Per Serving: 278 calories; 10g fat; 35.8g carbohydrates; 13g protein; 42mg cholesterol; 548mg sodium. This recipe is ridiculous. Just ridiculous. There is nothing earth-shattering going on here, yet the end effect is absurdly delicious. Sadly, my children cannot see the light yet when it comes to curry, but that just means Daddy gets not only the big piece of chicken, but a few extra smaller pieces, too. MOR CHIKIN! This was a big crowd pleaser! Be sure to add the red curry paste to taste as it can get pretty spicy the more you add. However, that wasn't huge issue with my guests. Make sure to get that chicken skin extra crispy! It's one of the best parts of this dish. The vegetables add still had a nice bite to them and complimented the curry well. Serve this on a bed of rice for a complete dinner. This recipe is absurdly delicious. Creamy, slightly spicy, but overall just an insanely delicious "UMAMI" flavor. I used panang curry paste because I had it from a trip to Thailand and it was amazing. Really cool how the snap peas get tender and delicious just from the residual heat. This one was absolutely delicious. Who doesn't love a red curry. I like mine spicy so I'll use more curry paste next time. This dish is one of my new favorites. I use chicken breast with the skin on just to make it a little more friendly to my waisteline. This recipe is so yummy and easy! The flavors are perfect for the sauce and we loved it served over brown rice. This is going into the weekly rotation. The crispy skin is amazing. Easy and delicious as is for ages 7-44. Served with jasmine rice. I made this last night. It was outta this world! I’ll definitely be making this again. I was worried that the Red Curry paste would make it too spicy but it didn’t. It was the perfect amount of heat.